Soundcraft 324 Live Mixer Flight Case 4.79906542056075 out of 5 based on 107 ratings. 107 user reviews. Thank you all very much well made, a great case to protect my mixer,a while for delivery but well worth it. I didn't read the small print thoroughly so build time/delivery was longer than hoped - Can't stress enough that this is my fault! The product is fantastic. The design is great, the build quality brilliant and, early impressions are that it'll take quite some heavy duty wear and tear. I would definitely recommend. Really well made, a great case to protect my new mixer/amp. expect to wait a while for delivery but well worth it. 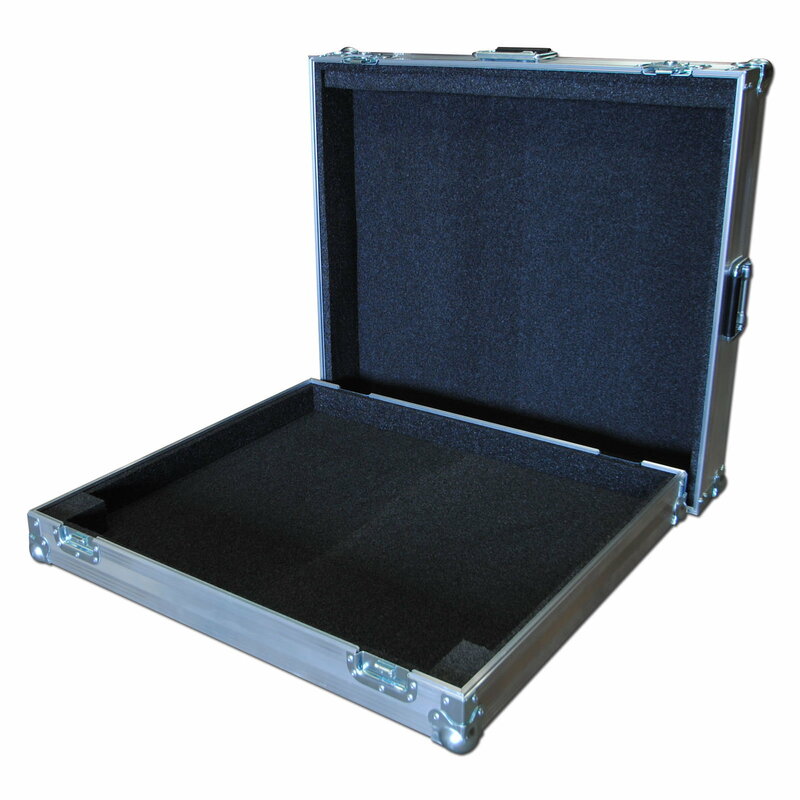 This is the third specialised flight case we have bought from Flightcase Warehouse. As usual the product is excellent and was very competitively priced. Would certain buy more items and recommend to anyone needing protection for expensive equipment to shop there. Great product, well priced , service and staff are excellent!! Build time was acceptable and I'm very pleased with the protection that the case gives to my mixer. We recieved case and it is what we were needing. Thank you so much. Sharp looking and good quality. Made to order , so naturally a waiting period. The wait though was worth it , high quality, good looks . Perfect tight fit, it could fall out of the back of the van & the mixer would be safe. Very happy, thanks guys. Took about six weeks to arrive but was worth the wait. Case looks nice and the mixer fits perfectly. It's a bit heavy as mentioned earlier in the reviews but seems to be very sturdy. Quite happy with it so far. Excellent product, perfect fit. Very robust, if a little on the heavy side, but I guess that makes it 'bullet proof'! Great customer service and really pleased with the case. Fits the mixer perfectly and is high quality. Excellent quality, very sturdy and great fit flight case. Very professional looking, would definitely recommend! Excellently made and really strong - a great fit for my mixing desk. It got bashed and dented by the courier before it saw any action but hey! its a flight case and thats what its built for isnt it? Excellent quality case, perfect fit for mixer, and most importantly the service was first class delivering a custom made unit to fit my tight timeframes. Very happy with the case. Fits perfect and can be left in one half in the case whilst in use. Well constructed and offers good protection. Very Happy With my case, extremely well made, easy communication and friendly. highly recommend this company ! Fine product. Arrived safely. Very satisfied with my purchase. I'm really happy with FLIGHTCASE WAREHOUSE - good communications and a very timely and efficient service. Absolutely fantastic, item received, exactly as required, arrived as expected on time, very grateful for such a good service and quality. Excellent service and a perfect product. Very pleasedwell done FCW!!! Excellent looking piece of kit. Fits the mixer like a glove, plus very sturdy case to protect it. I wasn't in a hurry so let them build it at their own pace (if it's a rush job you can call up and ask for your case to be built sooner), but it still arrived within a couple of days. Job done! Well produced flightcase. Exactly what i required. Fits as expected. Above and beyond again. Well done FCW. Soundcraft 324 Live Mixer Flight Case 4 Alain MOULY 6th September 2013 Excellent produit , ce Flight Case va "comme un gant" à ma PMP 6000 ...! Construction robuste , bonne finition , look agréable ...C'est ce que j'attendais . I have bought flightcases from you in the past for my Mackie 1642 VLZ PRO and VLZ3, and mixers and cases look brand new despite a few years of use, so you were the natural choice when I bought a 1604 VLZ3. Construction is first class with very robust fastenings. Fit is tight, but it is a very good fit, so the mixer is held very securely, and the height of the lid is just right for access to all parts. So good to have a hassle free product these days. Excellent case, fitting Peavey mixer like a glove. Rapid delivery as well. One very minor issue is that the side vents are covered when in case, so may not be advisable to use mixer in case. Not a problem for me though. Great quality flight case, really well made & sturdy. Arrived really quickly too. Have already referred others to use the company. I can only echoe the positive points raised by others previously. Very impressed with the build quality and the fit, and it arrived way ahead of schedule. I don't usually bother to write reviews for anything so that should speak volumes! Excellent flight case, very good fit, well made and delivered well ahead of the suggested delivery date. very good value for money. Excellent flight case, very good fit, well made and delivered well ahead of the suggested delivery date. Quality case. Excellent customer service!! I too am very pleased with the flight case for the Behringer PMP 6000 PA amp. The case has been finished to a very high standard with good quality fittings and the amp fits perfectly. The top can be removed and the PA run while sitting in the base. If you are looking for a flight case for your special piece of kit, look no further, these are the guys to provide it ! Very pleased with the case for my AW2400. Well made with fine quality robust materials and components. The case is as it was advertised and “no bigger than it needs to be”. When I first tried it I was quite taken by how it housed the workstation - it fits snugly into the dense foam padding and feels protected with no room for movement. There is a gap at the back big enough for the power lead and a few small items. Recommended. Excellent service and well made flight case. Very pleased, especially when I asked for a specific delivery date. Sturdy and well made case which was a perfect fit for my PMP 6000. I needed the case within one week and they pulled all the stops to ensure that it was delivered in time. Will definitely recommend Flightcase Warehouse to others! Arrived on time, looks impressive & the desk fitted perfectly. Would not hesitate to recommend to the rest of the guys. Very impressed - well made, perfect fit and lighter than expected. It arrived on a day my Father in Law (a former TV head of sound and sound engineer) was staying and even he was impressed. Very impressed with the build quality, price and service - will definately use these Guys again! Build quality brilliant, fits like a glove, strong and sturdy case, would recommend to anyone, very impressed. Wonderful sturdy case, my Behringer PMP6000 fits like a glove, and I couldn't be happier. Very impressed and great product for the money. I would recommend these guys to any one else want a case. Case it very well made, perfect fit very sturdy upon inspection, bit of a nasty scratch through delivery in no way as a result of the flightcase warehouse company will definatly use again. thanks. I bought this flight case for my new O1v96i and it fits a treat! The guys " FCW made it from scratch and it was delivered with in 2 weeks. It is rock solid and will protect me gear in transit for many years to come. Nice one FCW. I made the right choice here. The quality is excellent. Quick delivery, and value for money. Excellent case, great value for money. Think the previous reviewer must have his case upside down! Desk works in case fine, no problem. Superb quality product, swiftly made and delivered, if you need to run it in its case you trim the left side foam block and i use a foam block under the back edge. Overall i am very pleased,Thanks. Excellent, sturdy case. We've bought two of these so far for our two mixers and they are holding up very well. Really Great case, Thanks! Only constructive criticism is that the padding covers the power input and power switch if you what to leave it in the case whist in operation. Fantastic quality, fits perfectly and delivered ahead of my request, which was early anyway. Highly recommended. This case is perfect for the mixer. Well made, very strong and great protection. 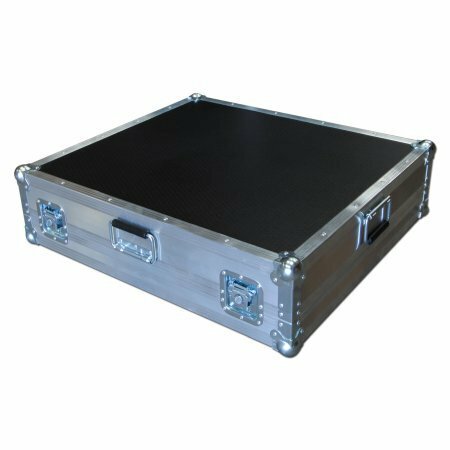 The service from Flightcase Warehouse was second to none and I have ordered from them regularly. Excellent stuff!! First class in every way. product and service. Exactly what I wanted, fitted perfectly, and arrived three days earlier than indicated. Excellent, well made, high quality case. Would definately buy from flightcasewarehouse again. These guys were recommended to me by someone in another band. It was childs play to find and then order what I wanted. When I realised I was pushing it a bit to receive the delivery in time, I emailed and asked them to deliver it earlier than planned. They did this without any question, following my delivery instructions to the letter. The case arrived well packaged, and fitted my mixer desk perfectly. It's refreshing to find a company with flexible customer service who keep you in the loop with what's happening. I'd be more than happy to recomend them. Flight Case fits perfectly and quality is A1. Delivery was on time. I'm a very happy customer. Great quality, which is what we've always experienced from Flightcase Warehouse. Mixer fits like a glove, top job! Great product, Great price. This case makes this mixer much easier to manouvre than the larger dog box wheeled cases which becomes a 2 person job. I can throw the cardboard boxes away now... Thanks for supplying these great mixer cases, they're perfect! I cant believe what I saw. I was amazed at the quality, the neatness and beauty of the case. I was extremely delighted with the quality. What a beauty, Thank you. Excellent quality, perfect fit, professional look and a reasonable price. Fantastic, thank you Flight Case Warehouse !!! Purchased this for my son - he was delighted with the quality. Also I was very pleased with the efficient service. Spot on ! Mixer is in, perfect fit. Thanks for a great product, the boys will be jealous !! Aj. Flightcase fits perfectly to mixer. has a small unremarkable damage (dent) in the lower metal frame. unfortunately the mixer stand is wider than the case, even in its smallest adjustment - to be improved! bought a flight case for a Behringer pmp 6000 mixer desk. The quality is outstanding. Superb finish.Very happy with the whole service. Excellent construction and fittings. We added castors which are really useful. Designed for 'in-case' use, although some of the connectors on the rear of mixer are located quite low and the mixer has had to be padded upwards a little. Still very happy with product. Great flight case - very well built. The case arrived perfectly in Denmark. It has a high quality and fits perfect to Hornbaek Jazzklub's new mixer. I will without doubt use Flightcase Warehouse again for future needs of cases. A very well built and solid case which fits perfectly. The price is very reasonable for the quality. Excellent service - Great quality - reasonably priced - what more can you ask for? Just a great flightcase.We will be using flightcase warehouse for all our cases! Awesome case, looks the part and protects my desk. Arrived within days of me ordering, a few scratches on the case but there will be plenty more soon ;-) Quality product and rad service!!! The mixer fits perfectly, the handle is just right, it's nice and robust...happy days! A top quality case, delivered when promised. Good fit for the mixer and not added too much weight to the already heavy mixer. I liked all the handles and carries well. Will deal again, best of all a good price! Good quality case and fits mixer really well. Great fitting case and good quality. Great quality, great price. Will definitely be using flightcase warehouse in the future! Great quality case and the best price I could find on the web. Takes 2 weeks to deliver but worth the wait.